A councillor has shared her harrowing experience of maternity service changes in the south Wales valleys. Alex Davies-Jones told Rhondda Cynon Taf colleagues that staff at Prince Charles Hospital in Merthyr Tydfil were "overwhelmed" by extra patients. She said many families had further to travel since consultant-led births at the Royal Glamorgan Hospital had ended. Cwm Taf University Health Board said the "difficult" changes were needed to ensure sustainable services. From 9 March, specialist doctor-led care for women and babies who experience complications during labour in the Cwm Taf area is only provided at Prince Charles Hospital. Councillor Davies-Jones, 30, said the conditions she found when she was admitted to have her first child induced on 27 March were "far from suitable". "There were four patients in a room made for no more than two beds," she told fellow councillors. "Midwives had to carry out intimate examinations and procedures in extremely cramped quarters. "My husband and I regularly witnessed staff openly crying at the dire situation as the amount of patients they had to treat in such a confined space was overwhelming." 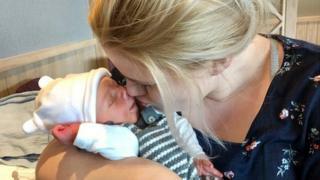 Two days after her son Sullivan was born by emergency Caesarean section, Ms Davies-Jones was discharged and had to leave her son at the hospital for further care - even though the midwife acknowledged she was not ready to go home to Tonyrefail. "She was ashamed to admit to me that they quite crudely just needed my bed," the councillor said. Ms Davies-Jones said she and husband Andrew were fortunate they were both able to drive to and from the hospital to see their son. However, she felt sorry for others including one mother who had no way of getting home after 10pm. "Witnessing her sobbing to the nurse that she couldn't leave her baby but had no way of going home and coming back was a particularly dark moment for us," she said. Council leader Andrew Morgan said it was "very clear" that the concerns raised when the reorganisation was first unveiled in 2014 had been realised. "These experiences are in no way related to the work of medical professionals and nurses, who are unfortunately now stretched to the limit under this new arrangement," he added. "It's evident that a significant rethink may be required to improve the delivery of care for mothers, parents, and their newborn children." A spokesman for Cwm Taf University Health Board told the Local Democracy Reporting Service: "We are committed to doing everything we possibly can to improve our maternity services and deliver quality care to women and their families. "We don't underestimate how difficult these changes have been for patients and our staff alike and would encourage anyone get in touch with us so we can answer any questions or do what we can to help address any concerns." The latest criticism comes ahead of an independent review of maternity services in Cwm Taf which is expected to be published shortly. It was ordered following concerns that women and babies may have come to harm because of staff shortages and failures to report serious incidents.